When I was a teenager in England during the 1960s, supporters of Josef Stalin were rare even among the “reddest” of leftists in the Labour Party. Leninists were more common, but the most frequently encountered Reds were supporters of Lev Bronstein, a.k.a. Leon Trotsky. Because Trotsky had been exiled and later murdered by Stalin, he had become the beloved underdog of Communism. The “Trotsky good, Stalin bad” meme was the way the Left maneuvered around the “excesses” of Stalinism — if only Comrade Trotsky had become General Secretary of the Party, what a different place the USSR would have been! The Italian Communist Altiero Spinelli (1907-1986) was a devotee of Trotsky, and also one of the “fathers” of the European Union. If you’ve never heard of him, you’re not alone — his name rang no bells with me until I read the article below from Poland. And I’ve even been inside the building in downtown Brussels that was named for him; I just wasn’t paying attention. A “masked” plan for Europe? The White Book of the European Future doesn’t mention Robert Schuman, Alcide de Gasperi, Jean Monet or Konrad Adenauer any longer. It transpires that the ideological father of the European Community is a little-known Trotskyite postulating the destruction of nation states and of private property. Is it his radical plan that is now being put into practice by Eurocrats? “Fog in the Channel — Continent Cut Off” was allegedly the title of a Times article in 1930. Whether fact or urban legend, it doesn’t matter, because it perfectly expresses the famous British “splendid isolation”. This aspect isn’t mentioned as one of the reasons for Brexit, but who knows? The mentality of nations reinforced for generations might have more influence than was ever suspected by accounting experts. But why would this ‘isolation’ awaken again? Perhaps, even at the last moment, the very nation that not long ago ruled over half the world decided that enough is enough. If, of course, as has become the habit in the EU, the referendum were not to be repeated or rendered void by some new treaty. Obviously the EU is advancing in a precise direction, about which everyone knows everything, and those who don’t know probably only pretend not to know. Everyone meaning the Euro-Mandarins. The conclusion drawn from World War Two, was that nation states cause wars, and uniting Western European states via close economic cooperation would remove the threat of another one. And where the peace east of the River Elbe was concerned, the Soviet Union would take care of that, in its own way. 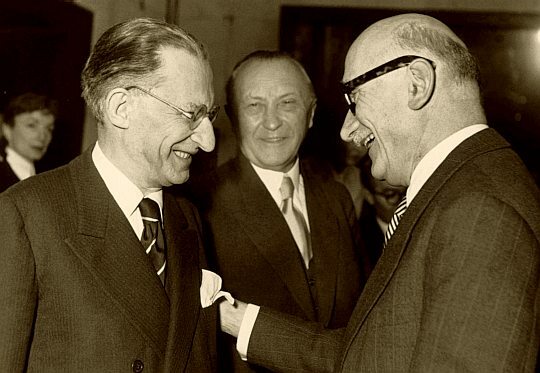 Former “fathers” of the European Economic community, the Christian Democratic politicians Alcide de Gasperi (Italy), Konrad Adenauer (German Federal Republic) and Robert Schuman (France) in 1951 in Strasburg. There were even voices about political integration in the form of a common country, following the example of the United States of America, but the road that was chosen was via a federation of ever-tighter cooperating — on the economic level — sovereign nation states. This is how first the European Coal and Steel Community, and later the European Economic Community and European Atomic Energy Community were created. In 2004 Poland joined the European Community, which was commonly known in the press and even in the internal documents as the European Union, even though it acquired this legal status later, after the Lisbon Treaty (2007). Whatever the name, we certainly were accepted into a federation of sovereign European countries. Time passes, and the citizens of the Republic of Poland, who voted in the referendum for joining the EU, maybe have begun to feel the discomfort of cognitive dissonance. Among voices coming from Brussels — besides the usual assurance that we will live in the EU in good health, increasing wealth, and mutual respect, with particular emphasis on respect for minorities — there’s a voice that seems to have reached the forefront concerning the virtue of unity. And it doesn’t look as if the suggested unity would be diverse; rather the opposite. Sovereignty, yes; but the Union has values that are required to be upheld. Those values are defined by conceptually capacious slogans that are imprecise enough, so that everything may be decided through interpretation. Therefore the interpretative code is of utter importance: Christian Democratic, [classical] Liberal, Social Democratic, or maybe some other. Above the main entrance to the building of the European Parliament in Brussels there’s a large inscription: Altiero Spinelli. It must be the name of someone, who had sizeable merits for the European Union, and who is very important for its theory, and perhaps also for its practice. Otherwise there would be no such an inscription in such a place. Altiero Spinelli, as reported by Wikipedia, was born to a family with socialist traditions, which means that he was weaned on Marxism. At the age of 17 he joined Italian Communist Party, which kicked him out for his “Trotskyite distortion”. Mussolini’s regime sentenced Spinelli to ten years in prison. Up until the downfall of Il Duce in 1943, he was isolated on the tiny island of Ventotene on the Tyrrhenian Sea, together with other opponents of fascism. In prison, and also later during his internment on Ventotene, Spinelli intensely studied Marxism. In 1941, together with the socialist Ernesto Rossi, he wrote “Manifesto for a Free and United Europe”, known as the “Ventotene Manifesto”. 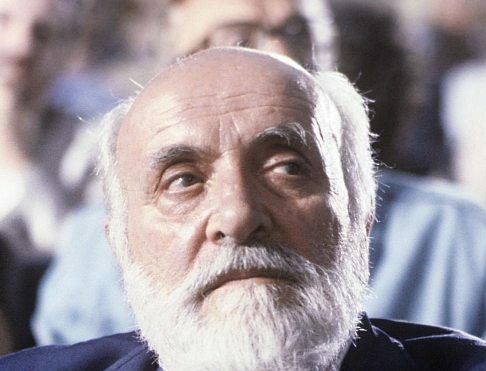 Until his death in 1986 Spinelli was working on the implementation of the theses of the Manifesto. In the Manifesto — after a historical analysis, in which the most recent European history forms a catchy triad: nation states, imperialism, totalitarianism, which in turn leads those totalitarian states to inevitable wars — Spinelli and Rossi proceed to formulate postulates and specify aims for post-war Europe. How to recognize a Marxist based on his speech and writing? By the fact that he has no doubts. A series of historical events arrange themselves for him in a “scientific” description of historical laws, historical necessities, which result in — just as in the attempt to cure the Black Death using cholera — the reparation of the world in order to bring happiness for future generations. Facts that don’t fit the “scientific” analysis are carefully omitted. Spinelli is pale and bland from the literary point of view, but the content of his manifesto is compelling enough, because — contrary to the works of his predecessors — it concerns us now and in the near future. A proletarian bluntness, without beating around the bush. National armies might inconvenience the European armed forces in bringing about revolutionary terror. So who will manage all of that work? Those “who accepted and made the European Revolution the main goal of their lives” are certainly Mr. Daniel Cohn-Bendit, Mr. Joschka Fischer and Mr. Guy Verhofstadt, the founders of the European parliamentary Spinelli Group in 2010, and the “delicate layer of sympathizers” invokes — with and without a reason — so-called European values, a passkey to explain reality and a hammer against wrong-thinkers. And how to “render the delicate layer of sympathizers (and all the rest) more homogeneous”? What about private property in the “true democracy”? So they will be able to confiscate everything or some of it, or even give something. From whom to confiscate and to whom to give will depend on the situation. In any case, things cannot continue the way they are — with some [ridiculous] legal private property — because this causes nightmares. Therefore the largest companies will be nationalized, and the middle-sized ones will introduce co-ownership by the workers. Sounds familiar, yes, at least to those who remember the former “one and only correct” [a communist slogan from Poland] political system east of the River Elbe. An how is this gallop towards progress going to end, what are its perspectives? Unfortunately, we have a long road before us, but the unshakable faith of Altiero Spinelli is our light in the tunnel. However, before the world unites, some things need to be solved on our European field. Not necessarily. Based on Ventotene Manifesto, in 1945 a so called ‘Spinelli Plan’ was written, which was the first draft of the constitution of the new, federal state of Europe. In 1992 the Spinelli Plan became the official program of the European Community, and then of the European Union. From then on the main building of the European Parliament in Brussels was dedicated to Altiero Spinelli. On September 22 2016, on the 30th anniversary of the death of Altiero Spinelli, Angela Merkel, François Hollande and Matteo Rienzi visited his grave in order to lay blue and yellow flowers there. At the press conference, after the ceremony, the heads of states were talking about the security of the Union and encouraged young people to take up challenges. Neither that newspeak nor that event made it to the headlines in the media. On March 25 2017 in Rome, European heads of states, “united in peace and friendship”, signed the “White Book of the European Future”. The document contains five scenarios of EU development up to 2025, and in the introduction it evokes the legacy of the Ventotene Manifesto. A scan of the cover of the first edition [of the Manifesto] was also included. “For generations Europe [EU] was always the future. The first time this idea appeared in the Manifesto of Altiero Spinelli and Ernesto Rossi, […] the Ventotene Manifesto called for creation of a free and united Europe, where existing divisions would vanish, and former allies and enemies would cooperate with one another, in order to not allow the return of ancient European absurdities.” The end of the document mentions the gratitude to the “visionary minds” of the Ventotene prisoners [Spinelli and Rossi]. The Communists Spinelli and Rossi are the only people mentioned by name in that document. And the Ventotene Manifesto is the only text that the document makes reference to. The website eszkoła.pl, which fairly closely reflects the [Polish] school curriculum, mentions four founding fathers of Europe [EU], and Wikipedia eleven. According to the “White Book” there was no Robert Schuman, Alcide de Gasperi, Jean Monet, or Konrad Adenauer. There were, however, the authors of the Manifesto, about whom youngsters — possibly due to the sensibility and the discretion of the grownups — don’t yet learn. The English translation of the Manifesto has only been available online since 2016. So out of many founding fathers of a united Europe there are two left, but really only one, because not much is known about Rossi; however, Spinelli is generally considered the main author of the Manifesto and he used to be an MP in the Italian Parliament and then in the Parliament of the European Communities, from the Communist Party list. The thoughts and actions of Spinelli were behind the attempts to introduce the European Constitution, which was not accepted by the parliaments of the member countries. That which was thrown away through the door came back through the window, and those who are good at looking will find worrying passages. 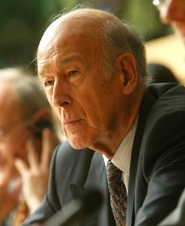 Just like what was claimed — according to Rzeczpospolita [Polish newspaper] — by Valéry Giscard d’Estaing, the author of this statement: “all the former propositions will be included in the new text, but they will be somewhat masked and concealed.” So the European Constitution will emerge when time is ripe. Only countries do have constitutions, but it looks as though Spinelli’s life afterlife has been very active. Anyone who lived to the east of the River Elbe and isn’t all that young anymore can spot between the lines of the Manifesto the strands of barbed wire. Concerning those to the west of the Elbe: their lack if experience may turn them into naïve enthusiasts. All the member states (Ireland after the second referendum) signed the Lisbon Treaty, despite Giscard’s having publicly spilled the beans. 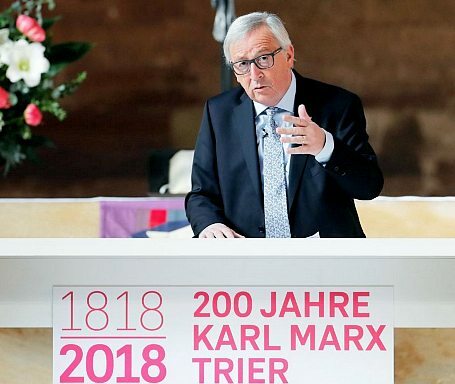 Recently Jean-Claude Juncker openly and very strongly praised Karl Marx. Our route is neither easy nor obvious. But this trip has to be made, and it shall be. This entry was posted in Civil Liberties, Culture Wars, Europe, History, Legal action, PC/MC, Politics, Stupidity, Treason by Baron Bodissey. Bookmark the permalink. What appalling architecture on which to have one’s name appended. I think May is keeping her powder dry for now and awaits the outcome of the midterms after which she will reevaluate her strategy. The US is still the only worldpower and its position after the midterms is crucial for a successfull Brexit. It’s very interesting. I’m in the process of reading the anti-Federalist papers right now. The anti-Federalist writers picked up immediately that under the Constitution, the United States would not be a confederation, or even a federation, but in fact a nation with states subordinate to the national government. The inevitable consolidation of power by a central government was put off by the 10th amendment, which attempted to answer the objections that the independent state governments would be gobbled up by the national government. Of course you have commies like Spinelli and Juncker constantly conspiring to impose the boot of fascist uniformity on everyone unfortunate enough to come under their jurisdiction. But, it’s a mistake to think that it’s a particular person or set of persons who create the drive for totalitarian unity. It is, but the lesson to be learned is, if not these people, other people will try the same tactic, using faintly different rationales. An example is the split between Stalin and Trotsky. To the extent that it wasn’t simply a fight for power, Stalin represented the nationalist point of view and Trotsky the global. In the end, it was Stalin who oversaw the consolidation of much of Europe into a communist empire. So, the difference between the two was not very great. There is a reason the European Union commies conspired against national governments. National governments represented the antidote to the globalist, power-grabbing, totalitarians who wanted to control every aspect of every life. With independent national governments, you can have Sweden go down the tubes, but neighboring Denmark and Norway pull back from the precipice by cutting off travel from the infected Sweden and other countries stupid enough to have hosted migrant hoards. The lesson is crystal clear by now: any alliance, treaty, or international organization must navigate strictly through bilateral negotiations between governments and at all costs must avoid a decision-making process independent of the state governments. Any mechanism for tenured, unelected, unaccountable authority will attract the useless, but highly verbal Marxists like sugar attracts flies. Glad to hear that someone else is actually reading them. Nothing really new. When world war 2 was lost (or, according to history books, when the partisans won in liberating the country with help from oversee alliance) all these crap communists were suddenly free. A country like Italy had always some communist party in parliament even beyond the collapse of Soviet Union (1991), up to 2008: in the election of that year they could no longer have enough votes to enter any of the chambers. Of course these people contributed to the European Union in some ways, which has been shaped on International Socialism. Anyway this ideology is gone, and many leftist parties replaced it with the opposite ideology which is progressive liberalism, multiculturalism and post-marxism. And how well is the name Jean Monnet known? To understand the drive to found what has become the EU, and the process by which this happened, an understanding of who he was and what he stood for is crucial. The “stealth approach” worked. For so long (perhaps I am wrong here), relatively few people understood the depth and extent of the resulting lack of sovereignty. National parliaments became something like empty shells, a kind of “Potemkin village in reverse”, in reverse because a national parliament was once real and hugely meaningful; a Potemkin village was empty from the start. “Castle of Lies”, which details some of the inconvenience, idiocy and horror that the EU has brought, was such a riveting read that I finished it within a day or too. First published in 1997, it has lost none of its relevance. Thank you for your communication, and its references to buttress your arguments. Without having read the books, I would give my opinion that the critical factor for a population to join the union was the promise of material wealth. In the US, with literally hoards of aliens pouring into the country, the number one issue polls find is healthcare. The people who are aware of the immigration problem can’t sleep at night, but most people focus only on how much money they have to pay doctors. Socialists have a lot to hide. Their goal is socialism; what they hide is that they give not a whit for economic (or any other) well-being. When Venezuela, a relatively prosperous country, went from middle-class prosperity to eating rats, the socialists mobilized the army and doubled down on their economic program of disaster. What do you think the result would be if you pitted national sovereignty against economic benefits in a referendum? Assuming, of course, the populace believed that the choice was a credible one, and they could indeed throw away their identity for more wealth? In the US, there is no concealment of the alien hordes coming in. You can tune in to Fox News anytime; even YouTube carries multiple videos, including videos by mainstream journalists with integrity like Sarah Carter of Fox News and Independent Women’s Voice. So, we must prevent the rise of totalitarian regimes by creating one? Doubleplusgood doublethink. I think it is a terribly sad irony that the communists managed to stigmatize nationalism after WWII — the “national” in “National Socialism” being the gift that keeps on giving. As though love of country and one’s own people in any normal country is the foundation for wars of aggression. As though Iceland has anything to fear from Greenland whose people might at this very moment be scheming to establish the Nordic Crescent from Jutland to Newfoundland. The true threat to decency in every corner of the world is totalitarian power. Such power was the essence of prewar Germany, Japan, and the Soviet Union and Islamic governments at any time. After the war, we witnessed the horrors of Soviet, Chinese, Korean, and Cambodian communism. But, no, the fools and demons in Europe demonized nationalism while laying the foundation for the E.U., the rejuvenation of the very political “solutions” that had caused the death of millions and terrible devastation. What is the European “Parliament” but a toothless debating club that awaits edicts from the Sun Kings in the Commission? National electorates can vote all they want for this or that MEP but it’s all utterly pointless. At best this was willful blindness (to which I supply the requisite horse laugh) and at worst exactly the kind of greasy scheming and deception so well described in Mr. Zwolinski’s fine article. I wrote initially of a sad irony. It is far worse than that. Mankind’s most fervent desire seems to be that they shall be ruled by odious fools. Everywhere Western electorates have shown that they have practically zero ability to recognize and act on threats to themselves, their cultures, the livelihoods, or their borders. Minuscule minorities of opportunists, dissemblers, parasites and grifters are able to lead mankind around like a bull with a ring in its nose. When all is said and done, mankind has proven itself capable of decent political life only provided the arrangement is not more complex than a tribal one devoted to moose hunting. Well, the schemers will prove to be too clever by half. Many more people will wake up to the fraud that Western democratic institutions have proven themselves to be. One dollar, one vote eventually lodges in the brain of even the most dull. Greasy Syrian and Balkan adventures anyone? How about goading the Russian bear and Chinese dragon? Poor baby. Was your earnest letter to your congressman ignored? America’s soaring national debt and looming pension tragedies, inter alia, reveal however, that the most educated, articulate, and brilliant minds have set in motion terrible destructive forces that are quite impersonal and utterly beyond the ability of any existing system to neutralize. Let us speak at another time of the utterly evil and repulsive minds that have inflicted mass immigration and population replacement on the West. That has not been hubris at work but satanic perfection itself. At about 9:47 a picture of a red triple cross on a black background with a white circle showed up. I thought that looks a lot like the government emblem on V is for Vendetta. It has a double cross with a circle around it. Similar color scheme. I guess that is a symbol for the Hertensteiner Circle. I did a google search in English and nothing came up. I copied the picture from the video and did an image search and got a few hits for google translate. It is an invitation only group of European Federalists and has a low profile because those links are all I found. The similarity of the emblem to the one in V as odd. I have to wonder where the one in the movie originated. Anyway I mentioned V because I it is one of those movies I will watch if it is on and I have nothing else to do but I always feel like they picked the least likely bad guys to actually be in that position. Maybe the double cross is symbolic in that case. Use Google Translate, it contains somewhat more information then the English Wikipedia version. So the abolition of private property in Euro-socialism is not so sacrosanct?…but seems to be managed in a case-by-case fashion? This is like saying that the sine qua non of capitalism is free markets with case-by-case government control. If you can’t figure out what the EU really believes in intellectually…just watch their behavior, what they are doing…which is a continual accumulation of power. Thus we have folks who cannot define what their goals really are trying to get power over the rest of us.